Daily Illuminator: Are You Ready For A Career In Dungeon Crawling? July 20, 2017: Are You Ready For A Career In Dungeon Crawling? Like a prophecy of old coming to fruition, the Dungeon Fantasy Roleplaying Game will soon be in the hands of fans eager for hack 'n' slash fantasy thrills. But what if the mere thought of that big box brimming with gaming goodness isn't enough? What if you're ready for adventure now? Pyramid #3/104: Dungeon Fantasy Roleplaying Game addresses this challenge. Its centerpiece is a solo adventure where you take the role of a swashbuckler trying to escape a deadly dungeon. It's designed to teach some of the Dungeon Fantasy RPG basics, and you only need the adventure, a pencil, paper (or a printout of its character sheet), and three dice. This issue also includes a batch of tables to help you generate an exciting heroic background for your adventurer, a system to inspire you to create adventure arcs – or even a full campaign – with a few rolls of the dice, and more. 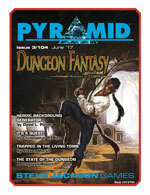 The Dungeon Fantasy Roleplaying Game will be here before you know it, but waiting just got a little easier with Pyramid #3/104. Pick it up today!